The [sands] of White Sands National Monument are not like the sand on your favorite beach. What makes this sand so different? Situated in the Tularosa Basin, between Alamogordo (northeast) and Las Cruces (southwest), the White Sands National Monument is a vast, natural playground of brilliant particles that reflect the sun – making the crystals shine “white” to the human gaze. Established as a national monument in 1933, White Sands covers 225 square miles (583 square km) and welcomes visitors from around the world to explore its unique beauty. 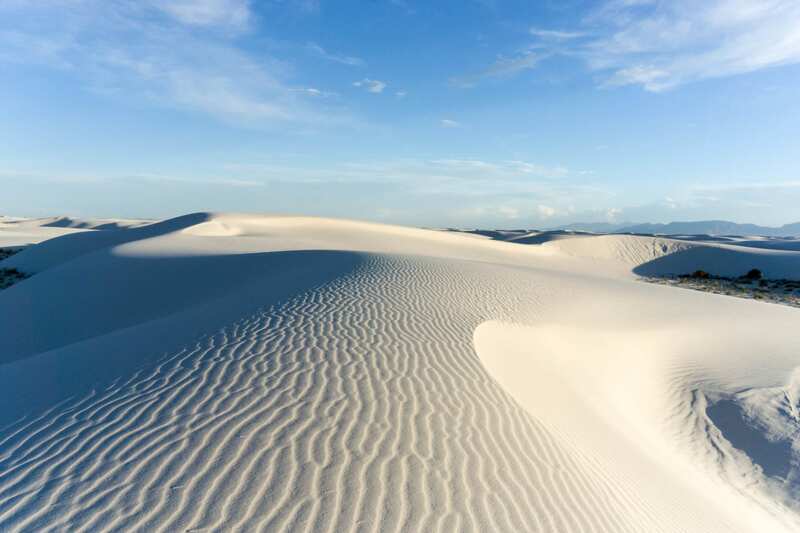 Adding to the wonder of the White Sands National Monument are five, cool facts that you can add to your “neat-to-know” knowledge base. 1) It’s [NOT] “regular” sand in the dunes. The “sand” in these miles of shifting dunes is not composed of silica, like most inland sand. Interestingly, the sand at White Sands is almost pure gypsum. Gypsum is different from many other rocks because it is readily soluble. That means it will dissolve in water, just like sugar or salt. When rain falls on the mountains, the layers of gypsum start to dissolve, and the gypsum runs down the mountains as fast as the water can carry it. Since the Tularosa Basin and the dunes are fully enclosed, there is no outlet to water of any kind, so the gypsum stays in the monument. 2) The sand is not actually white and doesn’t act like “sand” either. Gypsum is actually a clear substance; the dunes appear white like snow because the gypsum grains are constantly banging into each other. The scratches then reflect the sun’s rays making them appear white. Also, unlike silica sand, gypsum doesn’t absorb heat from the sun. So even on the hottest day of the year, the dunes are cool and comfortable to walk on, making White Sands a nice stop in the summer. Just visit when the sunrays are not at their peak, and remember to bring plenty of water to drink. 3) You can spot an Oryx here. Another reason White Sands is surreal: 93 African Oryx, a species of antelope from East Africa, were imported from the Kalahari Desert and set free between 1969 and 1977. Today, more than 3,000 animals, each weighing up to 450 pounds with horns that average 34 inches, roam the dunes. 4) You can ride, bike and play in the moonlight. So just what can you do in all this sand? The Dunes Drive, an eight-mile scenic roadway through White Sands, which leads from the visitor center into the heart of the dune field, is an otherworldly ride. Allow 30-minutes driving time for this 16-mile round trip, plus additional time for hiking, photography, sand play and other recreational activities. Moonlight hikes and sunset tours are available throughout the year from the visitor center, so visitors can get a whole new perspective as the light changes. During the day, four marked trails allow visitors to explore the dunes on foot; guided tours are also available where a Ranger leads the expedition. 5) It’s a Monument – [NOT] a Park. There is a difference! 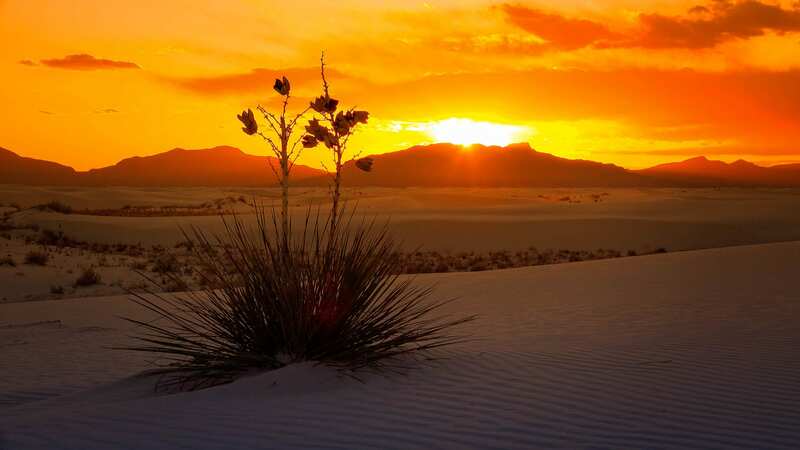 White Sands is a national monument, not a national park. The distinction? At White Sands, it’s the unique dune environment that’s being preserved. The gypsum dunes are home to a unique ecosystem of plants and wildlife, many of which only exist here in the northern end of the Chihuahuan Desert. Sunday - Saturday | 7:00 A.M. – 9:00 P.M.